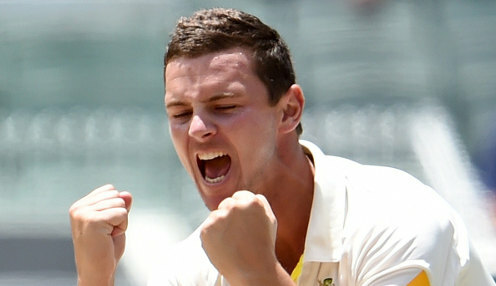 Pace bowler Josh Hazlewood says he's fit enough to play in Australia's World Cup defence next month. With selectors set to name their squad of 15 later this week, the 28-year-old looks to have timed his return from a back complaint just right. Hazlewood, who helped Australia win the last World Cup on home soil in 2015, said: "I've started bowling, I'm off a couple of steps at the moment, so that will start to ramp up pretty quickly through late April and in to May. "I've done a lot of work, rehab wise, running wise, gym wise. Everything should be fine." Having played 44 Tests and the same number of ODIs, Hazlewood is hoping to go on after the World Cup and play in the Ashes series. He believes that playing in the tournament will help him be fully ready for the first Test. "One day cricket, a couple of games a week for five or six weeks is probably perfect prep in terms of body load. Hopefully I'm there and we can hold on to the trophy," he said. His back injury forced Hazlewood out of the series against India and Pakistan, and Jhye Richardson came into the World Cup reckoning. But Richardson suffered a dislocated shoulder two weeks ago and time may be against him in his bid to make the squad. Hazlewood has claimed 164 wickets in Test cricket, at an average of 27.14, while in ODIs he has 72 scalps and has three times taken five wickets in a match. Australia are 4/1 to win the Cricket World Cup. Australia are 7/4 to win the 2019 Ashes series, with England 4/5 and the draw 5/1.